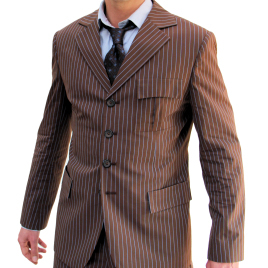 I had looked at a few other options for replicas of the Tenth Doctor's suit, and like others here, I decided to bite the bullet and go with Magnoli. I am so grateful that I did - it is WELL worth waiting for! Be sure to carefully take all the measurements (get a friend to help, and each measurement is also explained if you mouse over each entry). I did this, and the suit fits perfectly. Between this, the linen shirt, the chic glasses, and the tie replica, I felt giddy and overjoyed wearing it! If you're at all considering this, do it! Well worth every penny.